I went to Anchorage to attend a relative's graduation ceremony, so I went without an itinerary. But earlier that day, I watched the Anchorage Visitor Channel and took notes of places I wanted to see and do during my visit. 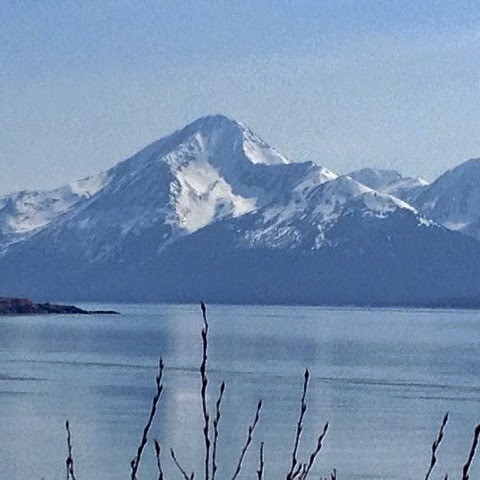 One of the recommendations was to drive the Seward Highway and experience one of the world's best drives. We were having lunch at a Vietnamese restaurant when I announced to my relatives the plan of the day. For some reason, ‘Turnigan Pass’ was stuck in my mind. I kept saying ‘Turnigan” and did not realize I was mispronouncing the word until the Waitress overheard our conversation. She was so polite though and did not correct me. Instead, she offered a little bit of history as to how ‘Turnagain Pass” got its name. She said that 'Turnagain' was literally taken from what Captain Cook told his party when they explored the area. In trying to find a Northwest Passage, they first went up the northernmost arms, but found only a river. They then came to the southern arm where Captain Cook ordered his party to turn again when they ran into a dead-end. After lunch, we headed south passing the marshy part of the Chugach State Park. After Potter Marsh, the highway tapered ahead of us, squeezed between cliffs and coastline. On one side, the gray rocks seemed to rise up to the horizon. On the other side, the Turnagain Arm looked particularly dramatic with the Kenai Mountains covered in snow and reflected on the water. Overhead, blue sky curved from horizon to horizon, embracing the “cool” wilderness. I could not fully admire the view while driving through a series of bends, so I had to stop at a few lookouts in order to enjoy the breathtakingly beautiful scenery and to take pictures. There are numerous attractions with observational platforms along the Seward Highway. A visitor can enjoy fishing, bird watching, photography, skiing, and other winter season sporting activities. Warning signs and information about a particular ‘point of interest’ were posted at the observational platforms. Points of Interest include Bird Creek said to be an angler’s paradise, where a sea lion could be seen chasing salmon into the mouth of the stream. Bird Point has views of the tidal bore; belugas frequented its dark water from early summer to September. We did not see any leaping salmon or belugas, but across the highway at Bird Point, we saw sheep grazing among the rocks on the slopes above. I noticed plenty of wildflowers near Girdwood. I pulled over to surprise my relatives with a visit to the Alaska Wildlife Conservation Center. (This will be featured in another post). Back on the road, we continued to find a more dramatic landscape. We got a glimpse of the slopes of Mt. Alyeska and many mountain ranges capped with snow before reaching the most anticipated Turnagain Pass. It was like driving in a half-circle while going up the stony mountaintops flecked with snow. I then drove for miles amid breathtakingly beautiful backdrop. The mountains seemed to close in around us as we neared Seeward. After passing the scenic Canyon Creek and Moose Pass, I only drove a short distance before our last stop, Seward, the end of the highway. I came to realize why the Seward Highway is considered one of the most dangerous drives in the world. I can only imagine driving through it in the wintertime. But even on a beautiful early summer day, it’s hard for the driver to keep her/his eyes on the road amid a visually captivating landscape.